"Pick up the journal without using your hands." An interactive book for kids and adults alike. 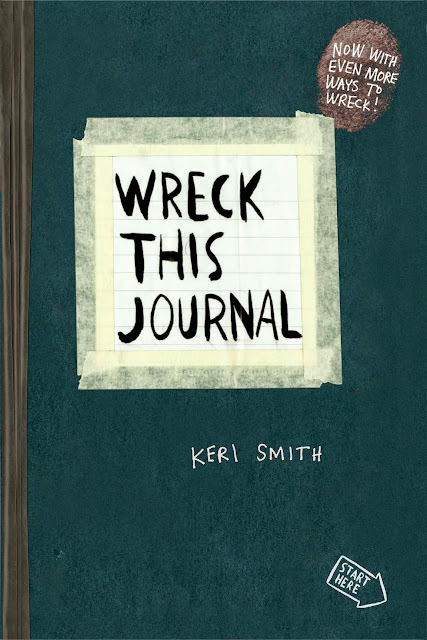 Keri Smith's Wreck this Journal series invite readers to get hands-on and enjoy some creative destruction and rule-breaking within the pages of this to-be-mangled book. While some instructions invite readers to break away from traditional book-owning etiquette ("Place sticky things here"), overall Keri Smith's novelty book is more for those who feel compelled to complete tasks or those who need some therapeutic but harmless frivolity in their lives. Wreck this Journal makes a great gift for someone who's going through a stressful time, needs a form of release, or anyone who could use a few minutes of fun.